Once a year, the world’s best sign spinners go head-to-head and compete for the world title at The World Sign Spinning Championship (WSSC). 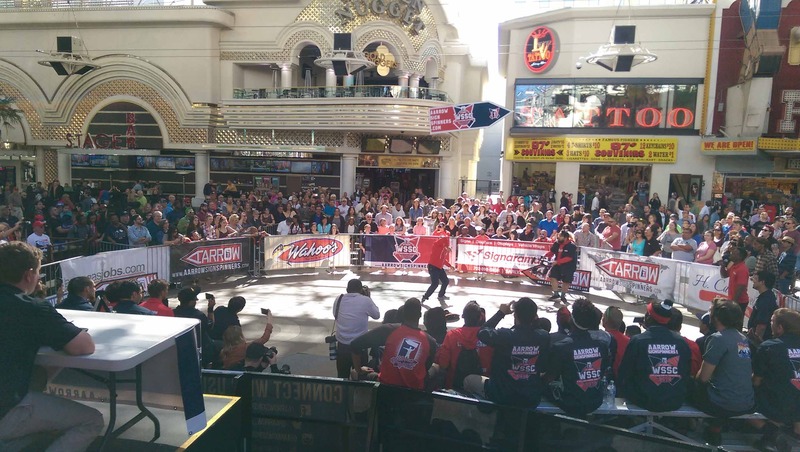 Taking place February 16-17, 2018 at the Fremont Street Experience, the WSSC is a unique global competition that entertains thousands of spectators while allowing youth AArrow Sign Spinners to showcase their athleticism, advertising skills, and creative style and personalities. Round one of the event kicks off February 16th from 12:00 PM - 5:00 PM, round two will follow on February 17th from 12:00 PM - 2:00 PM, and round three consisting of the finals, plus group spinning, and trick of the year will follow that day at 4:00 PM. The annual competition will feature 100+ sign spinners from markets around the globe who have demonstrated goodwill in the community, a commitment to serving clients, and honed the craft of sign spinning. The event will demonstrate how attending the WSSC is making a positive change in bringing the community together while showing youth support and encouragement as they spin for positivity. Each sign spinner has earned a spot to compete in the annual WSSC competition by pre-qualifying in a local round of competition in the market in which they work. Cash prizes and educational grants are awarded to the first, second and third place winners. For 11 years, AArrow and the Fremont Street Experience have been growing the world sign spinning championship. More than 750 youth have participated in the competition and its entertained more than 1,000,000+ cheering spectators. The event has also been featured on USA Today, NBC News, Las Vegas Sun, Fox News and more. AArrow is on mission to put a ‘Positive Spin’ on raising awareness for gang prevention while expanding its reach to further ignite the next generation’s interest in business, entertainment, and career advancement while on providing out-of-the-box advertising solutions and educational support. Visit https://www.aarrowsignspinners.com for the latest press releases and up-to-date news on guerrilla marketing and advertising trends. To learn more about how your business can increase its customer base while driving more revenue, call AArrow Sign Spinners at 323.944.2002 or email info(at)AArrowSignSpinners.com. Live to Give is a cause marketing agency with more than 15 years of experience in cause marketing, promotions, community-based campaigns, and communication. They deliver socially positive solutions and aim to be passionate partners with an "Always Deliver" attitude. AArrow is the leading global sign spinning firm, known for its signature creative spin on advertising and more than 40 locations across the world. The rapid expansion since its startup in 2002 has made sign spinning a popular sport and the firm a household name, being seen in everything from feature films, to popular music videos, to television commercials, to appearances on popular shows such as Steve Harvey, Ellen DeGeneres and Tosh.0.